The medical tubing set assembly machine can use either coiled and taped pre-cut lengths of PVC tubing. The medical plastic tubing can be manually fed by operator, or plastic tubing is feed from a reel of medical plastic tubing. The tubing is coiled and taped by the machine. The medical plastic tubing set assembly machine will have discrete assembly stations for each component that will be attached to the tubing set. A single medical tubing assembly machine does all of these operations. The medical plastic tubing set assembly machine can use an operator to load the individual pieces of coiled tubing (if automatic plastic tubing coiling and cutting is not supplied), as well as maintain medical plastic tubing set component levels. 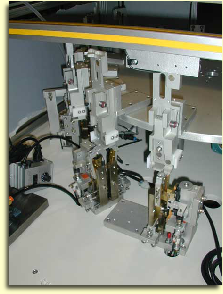 This machine is based on a 16 station Camco rotary table assembly machine base.